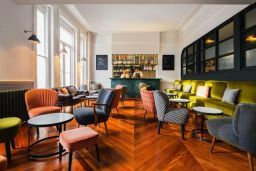 The Pilgrm Hotel, Cafe and Lounge in Paddington London, celebrates its first birthday this November. A pioneering venture from long time collaborators Jason Catifeoglou, Andreas Thrasyvoulou and Steph Thrasyvoulou, The Pilgrm opened its doors on the 1st November 2017. Since then, The Pilgrm, thought of as a new iteration of hospitality because of its careful redefining of hotel spaces and services, has gained wide spread recognition and success, most recently being included in The Sunday Times Top 100 Hotels list for 2018.